A splendid blend created by Nikka: this 12 year-old whisky is now the flagship blend of the distillery. 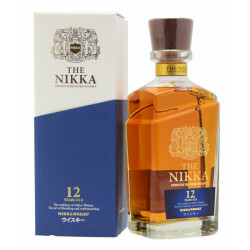 A splendid blend created by Nikka: this 12 year-old whisky is now the flagship blend of the distillery. As a Premium Blend, it includes a share of Yoichi whisky for its peated character, and a share of Miyagikyo for the fruity and refined texture. Bursting with flavours and fruits, this 12 year-old Nikka is gourmet, supple-bodied with toffee, caramel and delicious tangy notes of plums. 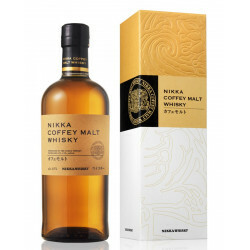 Nikka Coffey Malt is a Single Malt distilled in column stills of Coffey stills. Colour: gold with amber highlights. Nose: deep, spicy, with tangy notes of forest fruits coated with caramel and a hint of nutmeg. Palate: rich, gourmet and tangy with flavours of plums and fresh apples. A mild mid-palate, evoking pastries and caramel, toffee, spices and cloves. Finale: long, rich and fresh with white-fleshed fruits.